The "Broadway Block" project in Long Beach is expected to contain a mix of market-rate and deed-restricted, affordable units. 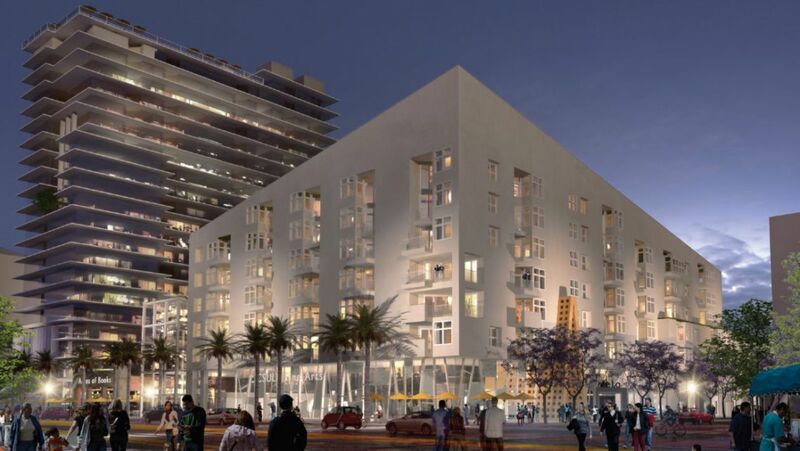 Developers Ratkovich Company, Urbana LLC, and Owl Companies have unveiled the latest version of the so-called Broadway Block project, a new 375-unit mixed-use development in downtown Long Beach, California. The $154 million mixed-use project, Longbeachize reports, will bring a collection of housing, office, and creative spaces to the city’s growing downtown area. The two-building complex is made up of a 21-story tower joined to a seven-story apartment block by a wide pedestrian paseo. Aside from the 375 units, the complex will also contain 5,773 square feet of creative office space, 3,873 square feet of flex space and 6,012 square feet of loft space. The complex is being built with an eye toward local California State University Long Beach (CSULB) students, as well, and will contain 1,311 square feet of so-called “ArtExchange” space and 3,200 square feet of general purpose space that will be shared exclusively with the university. The complex is expected to contain a mix of market-rate and deed-restricted, affordable units, with previous reports showing that roughly ten percent of the overall units would be designated as affordable housing for Cal State Long Beach graduate students. 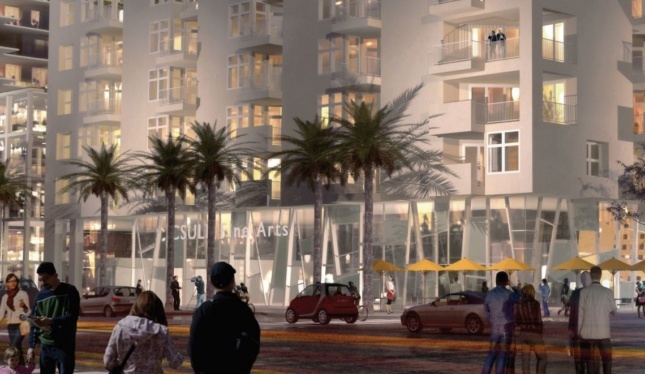 Renderings for the development depict the seven-story structure as a stucco-clad apartment block with ground floor retail and arts spaces. The building mass features inset loggia, projecting balconies, and an array of gridded, punched openings. 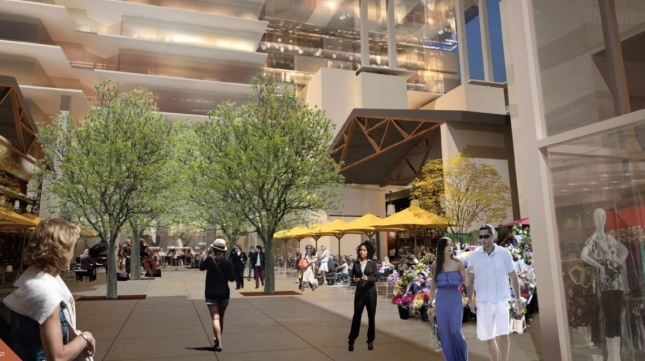 The accompanying 21-story tower is depicted with floor-to-ceiling glass walls and projecting floor plates while the paseo in between is shown containing trees, covered seating areas, and a collection of diminutive retail kiosks. 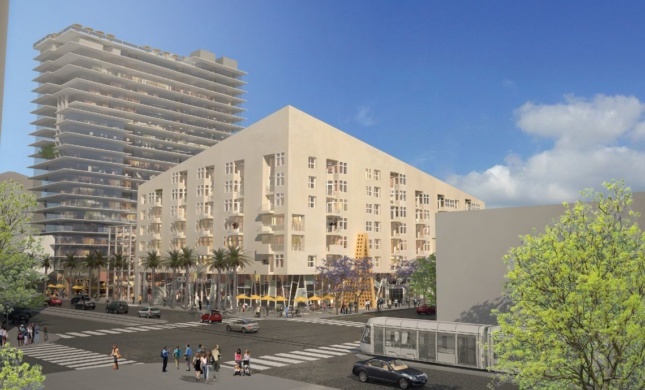 The project comes as Downtown Long Beach undergoes a bit of a revival. Architects SOM are currently in the midst of redeveloping the city’s civic center while a slew of other mid- to high-rise apartment developments and pedestrian improvements come to the district. Gensler is also working on a $250 million redevelopment scheme for the aging Queen Mary complex. The Broadway Block project is expected to break ground in 2018.